My Jaywalkers, originally uploaded by Craftydiddl. THEY”RE HERE!!!! my jaywalkers are all done-i sure took my sweet time but it was all worth it. 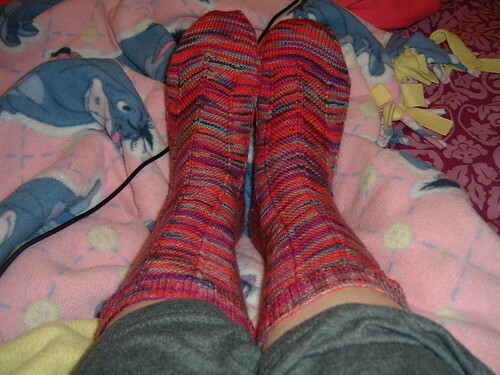 but i ended up using size 2 double-points to get the gauge and i knit the largest size. Now-it’s time to seriously look at some patterns for my Sock pal and then yarn shopping. And a washcloth from the Mason-Dixon Knitting book. I have to keep these hands busy 🙂 because cleaning and the little man don’t keep them busy enough LOL. No no they do but i am one of those people that can’t just sit and watch TV, I have to be doing something. Tonight i have so many shows on i like that i have to use the DVR. Off to wind my skeins into balls…by hand…its times like these i wish i had a ball winder but then i think this happens only about 5 times a year so its just not worth it. These are passed on skeins-trust me i would have had them wound at my LYS if i had bought them myself. Your socks are great!! Be sure to send a photo to Grumperina. She has a whole web page of Jaywalkers that people have knit. I love the Mason Dixon book. The washcloth is a fun project.